Big movers on this week's chart include "Come On Down To My Boat" by Every Mother's Son (#58 to #41), "Can't Take My Eyes Off You" by Frankie Valli (#67 to #43), "Seven Rooms Of Gloom" by The Four Tops (#77 to #46), "Little Bit O'Soul" by The Music Explosion (#75 to #50), "Ain't No Mountain High Enough" by Marvin Gaye and Tammi Terrell (#68 to #55), "Sunday Will Never Be The Same" by Spanky and Our Gang (up 30 points from #87 to #57), "Shake" by Otis Redding (#78 to #61), "Sound Of Love" by The Five Americans (#82 to #62), "Ding Dong, The Witch Is Dead" by our buddies The Fifth Estate (#86 to #63) and "Here We Go Again" by Ray Charles, which climbs from #90 to #73. 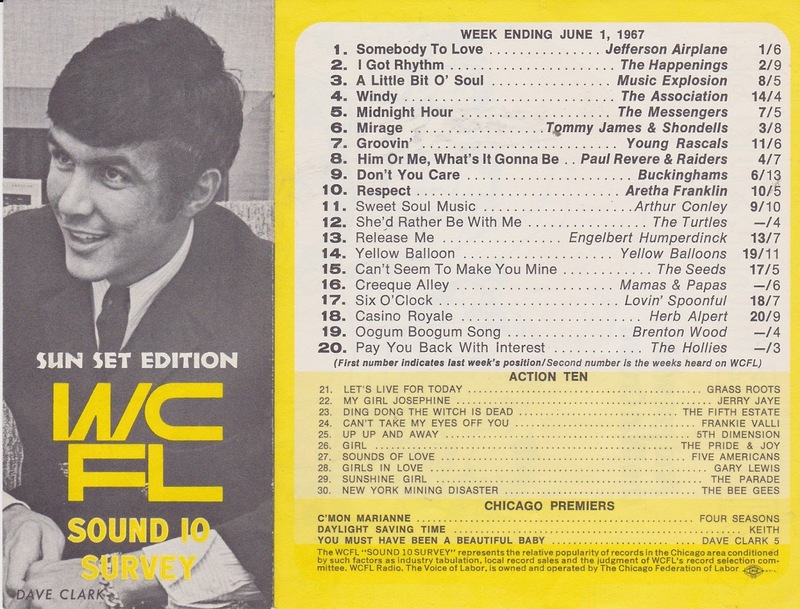 Paul Revere and the Raiders were scheduled to perform a three night stand (May 26th, 27th and 28th) beginning tonight at The Arie Crown Theater in Chicago. (Can you imagine these guys packing this place for three nights in a row?!?!? Amazing!) Unfortunately the theater has been closed since the January fire that engulfed McCormick Place. 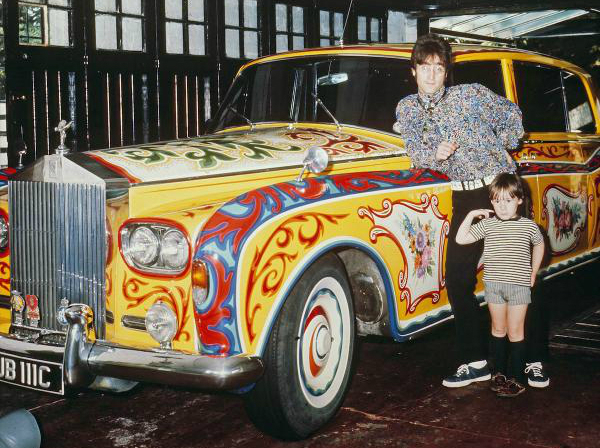 John Lennon takes delivery of his brand new, psychedelically painted Rolls Royce. Although George Martin is absent, The Beatles begin work on another George Harrison track, "It's All Too Much", earmarked for the upcoming "Yellow Submarine" soundtrack. A new Bobby Darin film "Cop Out" premiers … it tanks. The Jimi Hendrix Experience completes their first European tour with a concert at Tivoli Grona Lund in Stockholm, Sweden. 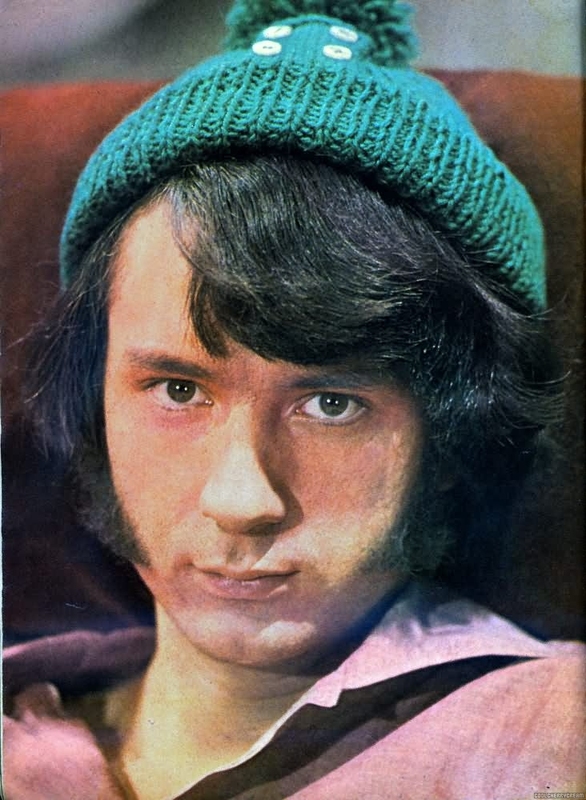 Monkee Michael Nesmith has a tonsillectomy at Cedars Of Lebanon Hospital in Los Angeles. As a result of this surgery, he will miss the taping of Episode 49 of The Monkees' television series (Monkees Watch Their Feet) on the 26th and the group will have to cancel their scheduled appearance at Spartan Stadium in San Jose, California, on the 27th. The movie "Stranger In The House", starring James Mason, Geraldine Chaplin and Bobby Darin, premiers in London. It will not open here in The States until January of next year. "Groovin'" by The Young Rascals holds on to the #1 spot for a second week as "Respect" by Aretha Franklin, "I Got Rhythm" by The Happenings and "Release Me" by Engelbert Humperdinck all creep up behind it in The Top Five. 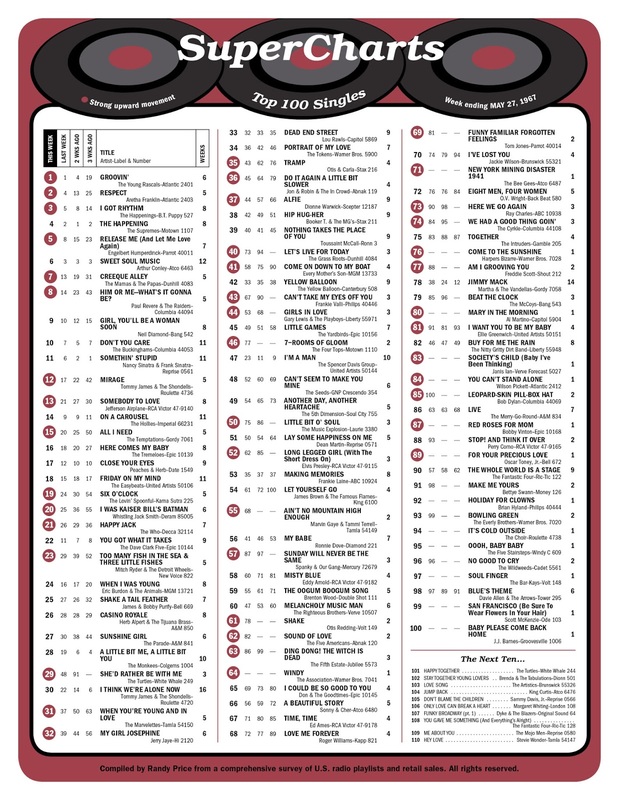 "Creeque Alley" by The Mamas and the Papas and "Him Or Me - What's It Gonna Be" by Paul Revere and the Raiders still seem to be joined at the hip, now occupying the #7 and #8 positions. "Mirage" looks like another Top Ten Hit for Tommy James and the Shondells as it climbs from #17 to #12 this week and Jefferson Airplane seem to have a pretty solid hit on their hands, too, right out of the box as "Somebody To Love" climbs from #21 to #13. "She'd Rather Be With Me" by The Turtles makes a big move this week from #48 to #29 … but nobody in The Top 40 make the kind of move The Grass Roots do, as "Let's Live For Today" climbs from #73 all the way to #40, a 33 point jump. "More Of The Monkees" continues its hold on the top of the chart. 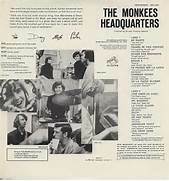 Incredibly, their debut album "The Monkees" is still in The Top Ten … and their brand new album, "Headquarters", released today, will soon join the fold! It will go on to become their third straight album to top the charts. (In fact, in 1967 alone, The Monkees would hold the top album spot for an incredible 33 weeks! 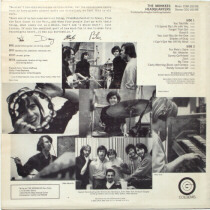 Save the week ending June 17th, The Monkees would have the #1 album in the country for 24 out of the first 25 weeks of the year … including THIS one as "More Of The Monkees" begins its 15th week at #1 on the US Chart! Back at Expo '67, The Ed Sullivan Show brings us Petula Clark, who performs "Don't Sleep In The Subway", "This Is My Song", and a medley featuring "I Know A Place", "Je Me Sens Bien", "My Love" and "Downtown". The Seekers are also on hand and sing their big hit "Georgy Girl". Sonny and Cher are among the guests on The Smothers Brothers Comedy Hour this week.